We are all thankful for the warmer weather, but with spring comes thunderstorms. And thunderstorms are a source of fear for some dogs. Storm season means some dogs will be hiding under beds, in closets or their crates. Many owners want to know how to help their canine friends to get through this common phobia. 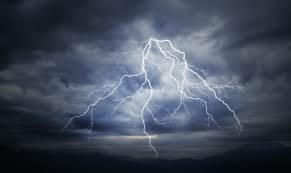 First, we need to look at thunderstorm phobia for what it is. Like any phobia, it is a symptom of a much bigger issue–a lack of confidence. Dogs that lack confidence don’t trust that they can handle stressful situations with their innate calming signals. When they are unable to calm themselves down, you will often see behavior such as panting, pacing, hiding, urinating or cowering. You may see multiple behaviors at once. To deal with the overall issue, you need to begin building your dog’s confidence by establishing leadership, teaching your dog problem-solving skills and requiring self-control during high arousal times. Once your foundation is in place and the dog’s confidence rises, the symptoms will lessen or even disappear without any extra work. Do not excessively baby or coddle your dog during storms. Doing this will reinforce to your dog that he has something to fear, and reward them for their behavior. If your dog comes to you for reassurance, you can pet her briefly and say “it’s okay,” but make sure you’re doing so in a confident, normal tone. Also, do not scold your dog for being afraid. Instead, be confident and matter-of-fact as a leader. Do not change your behavior just because the environment has changed. Ignore your dog’s behavior during the storm. Being calm will indicate to your dog that there is nothing to fear. If your dog tends to hide during thunderstorms, close off their preferred hiding spot. Hiding only allows them to avoid the fear rather than learn to deal with it. You may need to place a leash on your dog and attach him to you. You will still ignore him if he’s showing any type of nervousness or fearfulness, and you will only give him attention when he shows a small sign of handling the storm. This may mean he is not shaking, panting or pacing, or his ears and tail are up. You may give your dog treats when she is displaying confident behavior. Use tools if you need to. Yawning is a natural calming signal dogs use to calm themselves and outer conflicts. You can use this same technique to calm your dog. Be careful not to fall asleep! Thundershirt™, Bach Flower Essences or other natural calming agents can also be helpful. I do not recommend using prescription drugs unless your dog is consistently hurting himself during storms. Talk with your veterinarian about the best medicine for your canine.